RAFAEL NADAL: I don't know what's going on, I think. Nobody knows exactly what's going on, no? But having the club closed, all the places in Manhattan will be closed, so not much. Just stay in the hotel. Maybe watch some films. But we will see what's going on. I never had an experience with a hurricane. Is something new. I think is very bad for the city, for the weekend, for everybody. But, you know, that's a new experience, and not enjoyable experience, but we know how is when is hurricane. RAFAEL NADAL: Bandages, yes. The skin is still very thin, but it's fine. Q. A lot of people have said you've been stymied, you've been flummoxed by Djokovic this season. I mean, do you feel like if you possibly meet him in the US Open this week or next week that you have good chance against him? RAFAEL NADAL: Well, I am here. You know, I am here at the start of the tournament and you start to talk about a match against Djokovic. I have to win a lot to play Djokovic. And probably him, too. He's not in the final yet. I am focused on try to play well and try to have very good practice this week. That's what I am doing. And the good chances against Djokovic, those chances always depends how I am playing, how he's playing. Not talking about here, talking in general. After we will see, no? I think I played a fantastic year this year. I had a lot of victories all the year; I am not happy about how I played against him. RAFAEL NADAL: Well, it is something that we decided to do. Was the really first autobiography I was able to do. Was a good opportunity to work with John Carlin. We had a very good feeling together. He speaks in Spanish, too, so it makes a little bit easier everything to talk about the emotion and to talk about, you know... I think it was a fantastic experience. I talk a long time with him and remember a lot of things that you normally usually don't think about the past, no? So when you start to talk you remember, yeah, few moments of your career, few moments when you were a kid. Was interesting and I had fun, and hopefully the book will like to the people. Q. In the book where you talk about your parents' separation, it seemed like it came out of the blue for you, that you did not realize that they were having any troubles. Is that right? 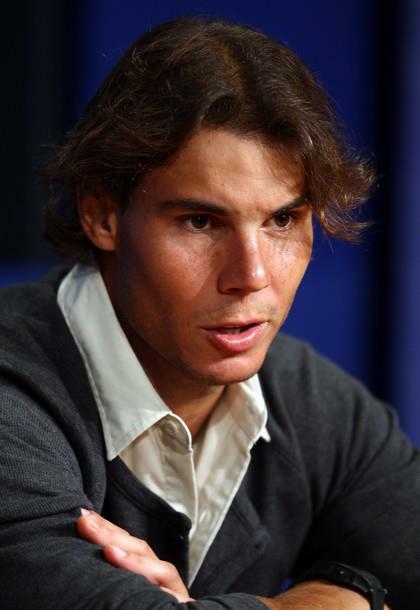 RAFAEL NADAL: I didn't understand that very well. (Translation.) You know, what happened there was but in the book - I never talk about my personal things in the press, but, you know, all the changes in your life needs a little bit of time. That's what happened. So after a little bit of time I was perfect, but, you know, at the beginning it's tough. But, you know, I am not the only one who has the parents divorcing in one moment of my life. Only thing is that Mallorca the family is very important, you are very close of the people that your friends, your family. So any change in this part, these people close to you, affects you, no? That's happened. That's past. Q. I understand how it affected you. What I don't understand is how you did not see problems between your mother and father. You did not notice problems between your mom and dad? 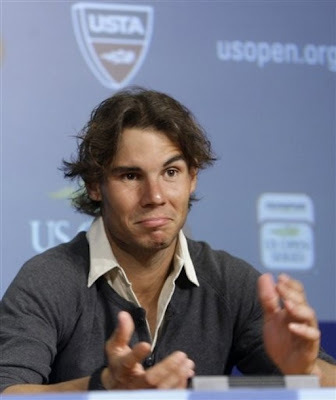 RAFAEL NADAL: I know the problems, but anyway, I gonna repeat you, I don't want to talk about that now. RAFAEL NADAL: The emotions probably are a little bit different, because when you come back after the victory of last year the emotions are higher. Of course, it was the last Grand Slam for me to complete all four. Was very, very nice moment of my career, one of the biggest moments of my career. That makes the comeback a little more special. But if we talk about the goal, is the same. Play well, try to arrive to the final rounds. That's the same, no? Pressure? I don't feel extra pressure. I am happy about how I did. I didn't play very well during the summer, but I am practicing much better here. So we'll see. Q. Have you been surprised this year by the turnaround, where before it was you and Roger for so long at the top, and now all of a sudden - Djokovic didn't come out of nowhere, but he really has jumped up very quickly this year. Have you been surprised by that change? RAFAEL NADAL: Djokovic didn't arrive this year, no? RAFAEL NADAL: He was No. 3 of the world for three years. That's not bad. RAFAEL NADAL: Only one, and most of the people never won one. For me is a little bit strange about the people here from tennis talks about Djokovic, about his big new improvement. Djokovic was here before, no? Djokovic played fantastic before. He had fantastic potential to be where he is today. He's doing great. He's playing without injuries. He's playing very solid, the mental, the tennis. What he's doing is something very difficult to repeat. For me surprise? I think for everybody surprise see a player that he's not losing. He's only lost two matches during all the year. For everybody surprising, but for me is no surprise that Djokovic is No. 1. For me is not a surprise that Djokovic is able to win Grand Slams, because he's very good. That's not from six months ago. Q. Two questions: One, you're 25 years old. Does it feel strange to have a book about your life at 25? And second, you seem like generally a pretty private person. What did you want to tell? What did you want to accomplish with this book? RAFAEL NADAL: Well, I am lucky. 25 years old and I enjoyed a lot of experiences in my life. You never know if you can have another book in the future, but I felt it's a good time to have that one. Is a little bit of the history of my life. Is a little bit of the history how I am where I am today. Just open a little bit more of my life to them, to the fans, to the people who support me, the people who are interested about me. For me, you know, now I am a little bit more open with the fans with the Twitter with the Facebook, and now with the book. So I am trying to be more connected with them, and that's probably a good way to do it.